Working in IoT or with embedded computer, you won't less than 1 time need to write an OS image file to a SD card (so that you can install new OS to your device later). For the tool to write image file, many websites often recommend Etcher, which is an Electron-based app. For Windows and Mac, that is fine. But for Linux, it sounds ridiculous to recommend such a tool. Not only does Linux already have GNOME Disks, which is most of time pre-installed, but also is it native, and hence, being lighter, running faster, having visual look consistent with other applications. Here is the photo of GNOME Disks writing image file to my SD card. The SD card appears with USB drive icon because I'm using a 3G USB dongle as card reader, after my laptop's built-in SD reader has been broken. And you can see, not only does it support writing to disk, but also can it do more with your disks. 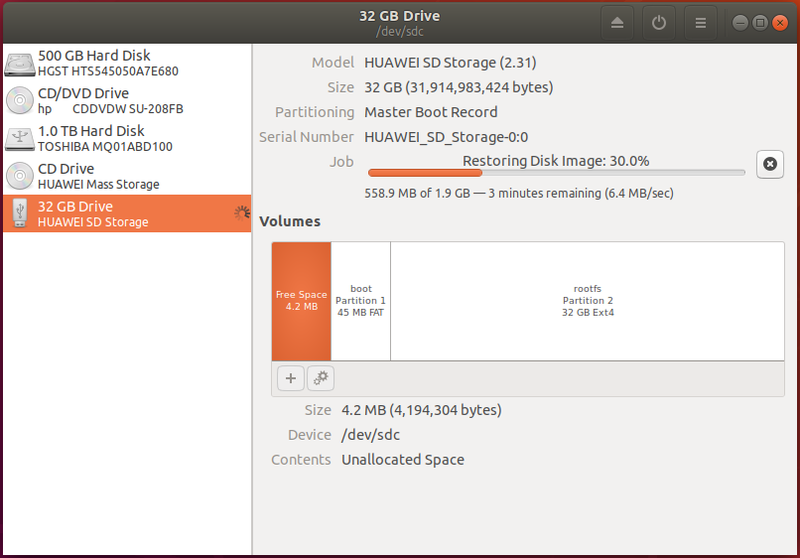 One of a things is that, it let you expand the partitions of the OS image to fit your SD card.